becanne is a magazine in PDF format dedicated to the scene. At this moment, only in spanish... probably in english in a comming future. it rocks! a very good idea! Great idea and really nice dezign... MORE PLEASE! looks good, but i don't understand spanish so.. oh; and what's the deal with adding it to every motherhumping category on pouet? Nice content, very nice design... like a paper magazine; the lack of interface isn't important In fact, it can't be called "lack". In fact, it's only a pdf, isn't it?. I'm afraid I frefer it... lol ! Can't wait till the next number! Arf!! Well, respect! from a non-active (by the moment!) scener. i am so amazed no one started flaming for lack of interface yet. i guess the trolls dont care about diskmags/papermags/pdfmags that much..
Great layout & great content. I like the fact that it's done mainly by Humphrey as I can't think of anybody active in the spanish scene with more background and knowledge than him. Leunam's article & pictures about Mac/Batman Group were also great. very profesional design and some good articles&interviews. I'm waiting for seeing it printed in paper!! amigas can read pdf files? just great... some errors due to it being the first issue (missing texts, weird layer layout at some points), but I'm sure those will be fixed for later issues. Looks really neat! But write some English in the future please..
for the amiga there is Apdf and a port of ghostscript - dunno if they work well, though. VERY greet mag on PDF format. Look's very professional. Very good. Im waiting for the next part! Looked really porfessional, but why do you store the text as images instead of plain text? If they had been plain text I would had been possible to let Altavista translate the articles into english. Please make the next issue in english, I wanna be able to read it too. 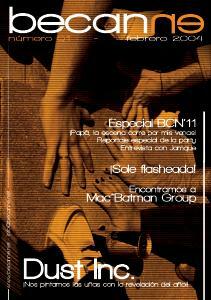 spanish-only mag dedicated to the demoscene???? Looks fantastic, superb production quality with some real professional photos and layout. Unfortunately like many here I can't comment on text as I dont speak Spanish. It certainly stands out as an example for anyone hoping to make an english demomag. What's with the "let's tick all those platforms" you pulled here? It's technically true, but not precisely the right thing to do. I don't see people tick all of those boxes for an AVI dump of a demo (imagine that). Other than that, using pdf isn't a really bad idea, good job on that one. cool idea, cool mag - why not english? english version please, share your mag! Great idea. Great issue. Great potential.